In 2019, its easier than ever to make a good income from home. There are hundreds of ways that you can earn a good income online with the power of the internet. Public relations agencies work to spread awareness of their clients to traditional media outlets. The best PR professionals have a working relationship with editors at magazines, newspapers, television networks and radio stations. A PR agency might create and distribute press releases, develop press kits, help with media campaigns and keep an eye on trends and issues that are relevant to the client. When you create a PR agency, you might choose to focus on a specific type of clients such as authors or small businesses. If you have knowledge of web coding and graphic design, a web design agency might be the perfect job. Web designers work with businesses and other clients to develop sites with the look and functionality the client needs. To start this business, you’ll want to be familiar with modern trends in web design for both computers and mobile devices. Strong branding is critical to any business venture, and companies and organizations will pay big money for an original and well-designed logo that conveys their brand. If you have skills in illustration, typography and graphic design, logo design might be the perfect fit for you. Look to build clients among small businesses and local brands as well as non-profit organizations and even fellow freelancers. As a copywriter, you will create written-to-order content for clients of all kinds. Most copywriters choose to specialize in a particular niche such as writing web content or ghost-writing nonfiction books for experts. You might also write ad copy or marketing materials for companies or brand campaigns. There are countless types of copywriting jobs available that will allow you to make a living with your words while choosing topics that interest you. Search engine optimization, or SEO, is the business of improving a website’s ranking in search engine results. As an SEO expert, you may write web copy or do web design as well, or you might work closely with other freelancers who offer those services. Running an SEO agency requires knowledge of modern search engine optimization techniques. You may spend your time researching keywords, building linking strategies and engaging in some online marketing to boost your client’s site visibility. With social media playing such a huge role in modern life, many brands and companies need to maintain a presence on sites like Facebook, Twitter and Instagram. A social media marketer can handle this, creating and sharing online content that will help build a brand’s identity while connecting with its target audience. Pay-per-click advertising (PPC) is a type of web-based advertisement that allows people to pay for their ads by the click or impression. This affordable advertising solution is popular on big sites like Google, Facebook and Amazon, and many businesses and brands don’t have the time or knowledge to make these ads work effectively. As a PPC advertising agency, you could put your expertise to work by devising ad strategies that will perform well. Combining the right text, images, target audience and budget is an art and science that can be worth quite a bit of money to the right client. If regular PPC ads are too broad for you, you can launch an ad agency that specializes only in Facebook ads. Facebook is one of the largest and most high-traffic sites on the web, and connecting brands with buyers on that platform is a big business. A Facebook ad agency specializes in creating ad campaigns for the site while maximizing exposure for their clients. Digital marketing strategies go beyond buying ad space or handling PR. If you’re interested in all of the ways that the internet can be used to promote brands, a digital marketing agency might be a great fit for your passions. The goal of a digital marketing campaign may be lead generation, brand development or sales conversions; as an agency, you’d work with clients to identify marketing goals and set a plan into motion. Conversion rate optimization is the science of boosting conversions or getting site visitors to take a specific action. A conversion might translate into a sale, a mailing list sign up or some other goal. What conversion optimization experts know is that conversion isn’t a matter of chance; there are strategies that can be employed to boost the effectiveness of on-page sales strategies. As a conversion rate optimization agency, you’ll work with businesses to improve their websites and digital marketing to boost conversions and grow the bottom line. Fulfillment by Amazon, or FBA, is a system that allows people to run virtual shops on the Amazon platform. Amazon stores and ships the items for you, making it easy to sell things. Most FBA sellers earn a profit by reselling items bought at low prices; after you buy stock, just ship it to Amazon where it will be warehoused and distributed once someone buys it. The Amazon affiliate program allows you to start an online business by linking to sponsored products on your blog or website. When you use affiliate links to direct buyers to Amazon products, you get a referral fee for every successful sale. This affiliate program has been a cornerstone of for-profit blogging for years, and it can be very lucrative. However, it does require a lot of traffic to start turning a profit, so you may want to use affiliate income alongside another business to maximize its effectiveness. Dropshipping is a form of e-commerce that allows you to sell goods without keeping them in stock. To run a dropshipping business, you’ll need to secure one or more suppliers who can create or store the items you plan to sell. You’ll then build a virtual storefront and attract customers who can order on-demand goods that you’ll then have shipped. Because there’s no warehousing needs, dropshipping businesses can be started right away with minimal overhead cost. Wholesaling is a B2B form of e-commerce that allows you to use online platforms to sell goods to other ecommerce retailers. Compared to brick-and-mortar businesses, e-commerce is fast and cheap to set up, and wholesaling can be a great way to turn a profit with minimal advertising expenses if you know your niche market well. E-commerce allows you to set up a virtual shop and sell items across the country or around the world. Depending on your skills and interests, you might operate as a reseller, craftsperson or designer for print-on-demand goods. The options are limited only by your imagination and interests. Opening a storefront is as simple as setting up a website. A commission-based sales job is one that pays you a portion of the profits from sales that you make. Sales positions that pay on commissions can be very lucrative if you’re a good salesperson. Many commission-based sales jobs are independent contractor gigs that will allow you to work on your schedule. Because you earn only when you sell, there are no wages when you’re not selling a product. If you find a company and a product you feel good about and have the skills to succeed, making a living with commissions is well within your grasp. Sometimes a business or merchant will pay a commission to another party, or affiliate, to promote a product. This promotion often takes place online through sponsored blog content, social media posts, videos or other interaction. Affiliate marketing can be a valuable source of income if you have an online platform or access to a lot of potentially engaged buyers. A life coach is someone who helps a client overcome obstacles and make changes in their lifestyles to become more successful. Life coaching isn’t like therapy or traditional counseling. Instead of focusing on an individual’s past, life coaching is goal-oriented. You will need to complete a certification program in order to get started, but once you’ve completed your training you can begin finding clients and helping to play a hands-on role in improving their lives. A health coach works one-on-one with clients to find ways to improve an individual’s health and wellness. This goal-oriented job might focus on exercise, diet, sleep, stress reduction or any other goal a person may have to reach a better life. To become a health coach, you’ll need to complete a certification program. Studying nutrition can help you on your way toward this career as well. If you have experience in marketing at the professional level, you can put that knowledge to work with a consulting firm. Consultants lend their knowledge and expertise to clients in order to improve their marketing efforts and achieve greater success. Consultants may also work side-by-side with agencies and firms to improve performance in a top-down manner. Similar to a nutritionist or personal trainer, a fitness consultant works with clients to create a fitness routine or workout plan that will help to reach a specific goal. Whether the goal is weight loss, strength training, endurance training or something else, a good fitness consultant has the experience and education necessary to craft an effective strategy. Social media consultants work on-on-one with clients to improve the impact of social media campaigns and brand interactions on social platforms like Facebook and Instagram. Consultants usually don’t create content or maintain a page; instead they review an existing strategy and provide insights and strategies for improving performance. A social media consultant may work alone or in tandem with an agency. Fashion consultants give professional fashion advice to clients, drawing on experience in the fashion industry and an in-depth knowledge of trends. Your clients may be celebrities, high-powered executives or others whose dress plays an important role in their image. Also known as a tax advisor, a tax consultant is a financial professional with experience in tax law and compliance. As a consultant, you may aid in tax preparation for your clients as well as working with clients throughout the year to minimize tax liability and help with tax-related financial matters. Sales consultants act as a bridge between a company’s sales team and its customers. A good consultant brings experience and knowledge about sales and how to best maximize profits while maintaining the customer experience. Consultants may be customer-facing, answering questions and acting as a liaison between brands and consumers, or they may do short jobs on a contract basis to help overhaul a company’s sales strategies. A certified wellness consultant may help a client achieve wellness and lifestyle goals. As a wellness consultant, you may fill the role of life coach, nutritionist, personal trainer and more as you help your clients achieve full-body wellness and holistic health goals. A certified personal accountant requires education and experience with matters of personal finance. As a CPA, you may work with clients to handle budgeting, tax preparation, investments and more. If you have experience as a CPA, you can offer your services digitally to connect with many more clients than you might be able to meet in person. Also known as a management analyst, a business consultant has extensive experience in what makes a business successful. Consultants may work with small, medium or large businesses to analyze the company’s operations and identify weaknesses and solutions for improvement. You may consult in areas such as management, human resources, accounting and even marketing depending on your strengths, clientele and specific experience. Your passion for yoga doesn’t have to be limited to in-person classes. Online yoga instructors teach students virtually through video lessons, interactive chats and other tech-based tools. A virtual assistant fills the role of a secretary or assistant to another individual. You might work for a small business owner or freelancer who needs help with basic tasks to keep their own business running. The duties you complete may vary depending on your client and the jobs they need done; a virtual assistant might help with things like email management, customer follow-up, and receptionist duties. eBay flipping is an exciting and fast-paced e-commerce business built around buying items at a low price and reselling them for a profit. Making a profit on eBay requires a bit of research to understand what items sell best and can be moved most easily, but once you get a feel for it you can launch into this business with almost no overhead. A freelance web or software designer can ply his or her skills on independent projects without being tied to a specific company. You might work on your own projects or complete work-for-higher developer jobs for others, but the freedom of choosing your own projects makes this a very attractive work-from-home career. Graphic design jobs are varied and provide plenty of opportunities to use your artistic skills. As a graphic designer, you might work on ad campaigns, book covers, websites and more. A freelance graphic designer has the freedom to choose his or her assignments. As a freelance writer, you make money with your words. You might sell articles to magazines, publish a blog or do writing-for-hire for clients. Working as a freelance writer allows you to choose your assignments and build a portfolio that matches your creative talents and interests. Because YouTube shares ad revenue with creators, posting videos can be a creative and lucrative business. Success on YouTube means knowing your niche and understanding your audience in order to maximize views and keep people watching for a long time. No matter the video format, videos that capture a lot of traffic can generate money through ads and even gain secondary income from viewer donations, affiliate opportunities and more. Twitch is a platform for hosting livestreams. Popular with gamers, it can also be used for other formats of live entertainment. Twitch streamers make money from subscriptions and donations from viewers who choose to pay for their content. If you become well-known on the platform, gaming companies and others may pay you to play their game for your audience, boosting your income potential. Podcasts are like modern radio shows. If you have something to talk about and a passion for the spoken word, podcasting can be a great opportunity to get your name out there. Most podcasters make money by selling advertising space during their shows. You can also get money from selling merchandise and getting donations directly from your fans. Etsy is an online marketplace for handcrafted and vintage items. You can make money by selling your own handmade goods and crafts, from jewelry to soap. You can also sell vintage items and crafting materials for other people to use. Many print-on-demand t-shirt companies now exist that will pay money for original designs. You can sell your unique designs for a flat rate or receive a commission every time someone buys one of your shirts. 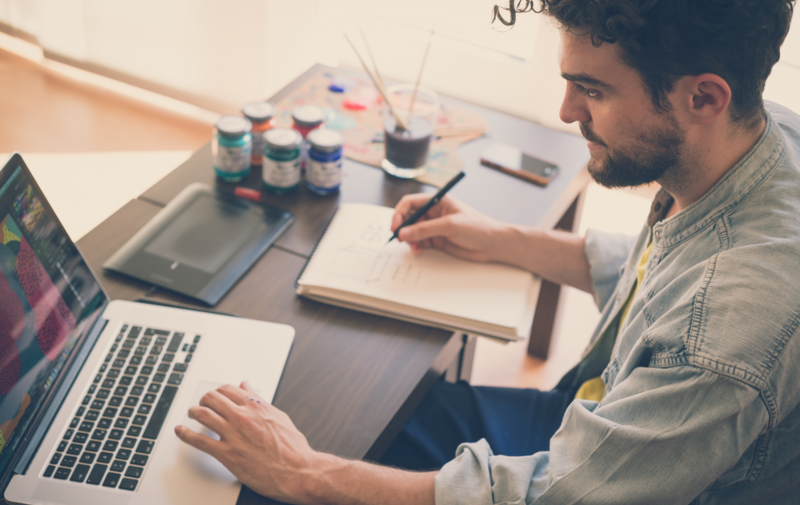 If you’re a prolific artist with an eye for fashion or a sense of humor, t-shirt design could be the fun work-from-home job you’ve been dreaming of. A freight broker is an individual that works as a go-between for shippers and transportation services. Licensing takes just a few weeks, and you’ll have a flexible job that allows you to work with business owners to get goods shipped across the country. Bookkeeping and clerical work can be performed on a freelance basis, allowing you to keep ledgers and accounts for businesses as a private contractor. As a bookkeeper, you’ll record transactions and keep a record of costs and income. You may also generate financial statements and reports for businesses. Bloggers maintain online publications posting about niche topics. Popular blog topics range from parenting, personal finance, health, automobiles and more. If you have something you’re passionate about, you can turn it into a job with blogging. Bloggers are usually paid through ad revenue on their blogs and by using affiliate programs; you may also be able to sell your own products or get donations from readers. Meal planner services offer customizable diets and meal plans to clients. Meals may be designed with specific goals in mind such as dietary restrictions or budgets. Meal plans will usually be accompanied by a grocery list. You might offer premade meal-planning templates, personal consultations or even fully prepared meals that can be delivered to customers. Influencers are people with a large following on social media. Because their followers are engaged with their content, these influencers can make money by sponsoring branded campaigns and recommending products. Influencers exist on many platforms, but Instagram is one of the best-known social media sites for professional influencers. You can write books and guides to share your knowledge on many topics and self-publish them to sites like Amazon for a profit each time a copy is sold. With a bit of determination and knowing your audience, you can also make money as a fiction author selling books you’ve published, especially if you choose a genre that’s in high demand. If you own property that you’re not living in, you can put it to use as a vacation property. Sites like Airbnb make it easy to rent out your property, but they’re not the only way to become a vacation rental owner. You can rent out a house, time-share a condominium or event rent a room to boarders for special events. Direct sales take place away from a retail store. For example, you might sell items at a booth at an event or through special in-home shopping parties and events. You’ll receive a commission for the sales you make. You may also make money for referring others to the program. You can make money by inventing and patenting new gadgets and processes. If you can come up with a clever new way to do something and design a prototype, you can earn money as an inventor. Busy pet owners always need help with their furry friends. You can offer in-home pet sitting and dog-walking services to your neighborhood. Several apps exist that can help connect you with paying customers like Rover and Wag. Some call center jobs can be worked from home. You can answer calls from your computer and handle customer service questions and more for companies around the world. If you have a teaching certificate or relevant degree, you can use your knowledge and skills to tutor students online or teach online classes. You set your schedule and can choose the subjects you teach, making these online jobs very flexible and easy to jump into. An event planner helps to organize events and manage their logistics for clients. In this line of work you might plan and coordinate weddings, corporate functions, fundraisers and more. Having some experience in hospitality or a related field can help get your foot in the door with this exciting job.